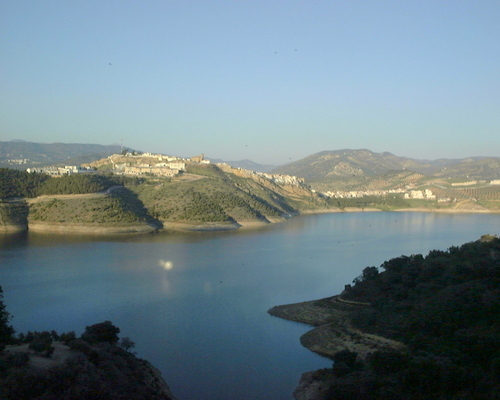 Iznajar is situated near the southerly border of Córdoba province, and serves as a natural entrance to the Sierra Subeticas Natural Park. From the top of the town there are tremendous views where, on a nearby hillock, the old Moorish castle frowns down on the lowly houses. Also worth visiting is the Iglesia de Santiago church, built over time during the fifteenth and sixteenth centuries, with a remarkable late addition in the form of a Baroque altar piece. The cemetery next to the church only dates back to 1806. The most interesting district of Iznajar is the Barrio del Coso, a labyrinth of typical whitewashed Andalucían houses dotted around a labyrinth of narrow lanes that criss-cross the promontory. As is often the case in these hill towns, the lower part is also the newer part of town, and the central Plaza Nueva affords excellent panoramic views of the surrounding landscape. Local cuisine reflects Iznajar's position in a prime pork production region as well as variations on classic Andaluz platos. During the February carnaval, the traditional pork sausage filling is stuffed with eggs, bread, jamón and breast of turkey. Other specialities include the rich salmorejo with orange and cod, and La Porra, a cheap and filling stew of tomatoes, bread, peppers and jamón. Unsurprisingly, Semana Santa, Easter week, is the most important festival here. Perhaps uniquely, townsfolk come together to present a religious theatrical epic in which amateur thespians take on the roles of figures in key scenes from the bible and the crucifixion. 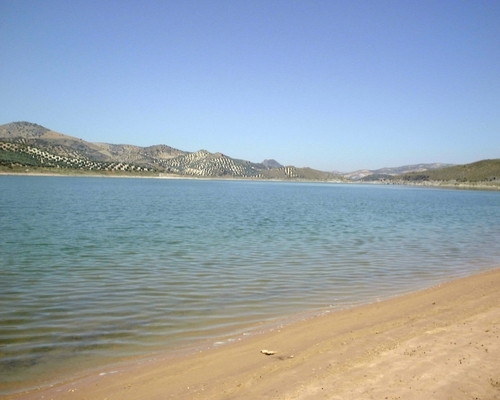 The inhabitants celebrate the day of San Marcos on April 25 by quitting the town entirely for a mass picnic in the countryside at Valdearenas, a recreational area close to the lake. There is a beach on the lake at Valdearenas where you can swim, rent pedalos and canoes, and learn to sail (and possibly other water sports). It tends to be busier on Sundays but is very quiet during the week, even in the height of the season. The water is beautiful to swim in, the bathing is safe and the beach has sand to lie on or for children to play in.